In understanding and defining color, the terms “warm” and “cool” are often used to describe a color. In general blue, green and purple are considered cool colors while yellow, orange and red hues are considered warm. 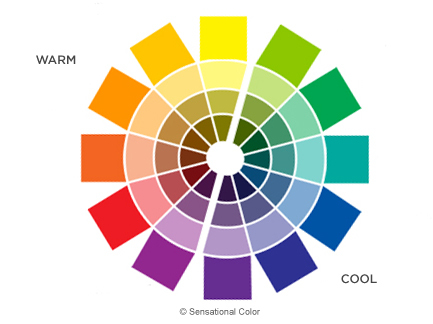 The color wheel above shows the relationship between the warm and cool colors. The temperature of a color is based on its association with certain physiological and psychological feelings rather than actual temperature. For example: a warm orange feels cozy like a crackling fire or a cool blue feels as calming as a sea breeze. There is also something known as relative color temperature. When comparing the different colors, one can be warmer or cooler than another. For example if you were comparing two variations of purple (violet) one could be warmer/cooler than the other. When comparing the purple (violet) in the center of the colors above with the two variations of purple on either side of it, you can see how the one to the left is warmer (more red) than than the one in the center or to the right. You can also see how the one to the right of the center square is cooler (more blue) than the square in the center or to the left. In the case of two different variations of the same hue, one square would be described as cooler if has more blue, violet or green undertones than another; whereas it could be described as warmer if it has more red, orange or yellow undertones. For example, both of the red squares above would be considered warm when speaking in terms of all colors. However, when comparing one of the red squares to the other, the red square on the right is cooler than the red square on the left. Can you see that the red square on the left has stronger orange or yellow undertones than the one on the right, which leans more towards violet or blue? Describing one square’s color as warmer or cooler would be to define its temperature relative to the color of the other square. In addition to the various physiological and psychological effects, warm colors optically generally seem to advance and expand while cool colors recede and contract. These characteristics, however, are relative since the intensity and value of the color will also affect the spatial action of warm and cool colors.